‘The Smile’ was open from 10am – 9pm, 17 September until 12 October 2016, at the Chelsea College of Art Rootstein Hopkins Parade Ground. 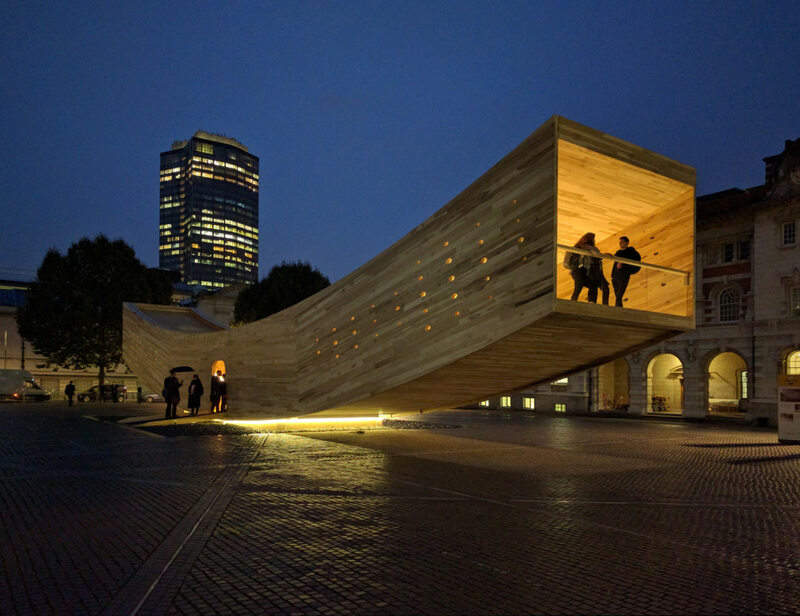 Alison Brooks Architects has collaborated with The American Hardwood Export Council (AHEC), Arup and the London Design Festival to present this cross-laminated tulipwood structure. The Smile is one of the Festival’s Landmark Projects, which can be inhabited and explored by the public. The spectacular, curved, tubular timber structure measures 3.5m high, 4.5m wide and 34m long and is effectively a beam curving up at both ends. Showcasing the structural and spatial potential of cross-laminated American tulipwood, Alison Brooks’ concept is the first ever ‘mega-tube’ made with construction-sized panels of hardwood CLT.